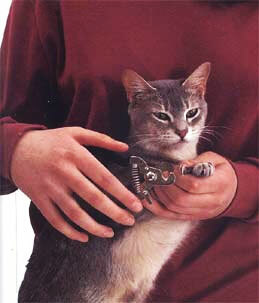 If possible, start training your cat to have her claws trimmed as a kitten. 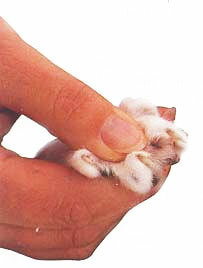 Gently stroke your cat's paws often, getting her used to having her paws held before you attempt trimming. Be sure to reward your cat with a special food treat - one that she receives only during claw trimming or some other grooming procedure - during or immediately after trimming. The best time to trim your cat's claws is when she is relaxed or sleepy. Never try to give a pedicure right after a stressful experience or an energetic round of play. Many people hold the clippers at right angles to the nail, thus cutting across the nail. This tends to make the nail more subject to splitting or fraying. It is better to hold the clippers in a vertical position--that is, up and down, so that the claw is trimmed from bottom to top instead of across the nail. This position help prevent splitting. Notice the pink tissue (the quick) on the inside of the claw. 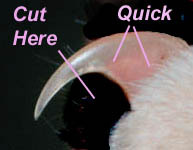 Avoid the quick when you trim the claw; cutting into it will cause pain and bleeding Remove the sharp tip below the quick (away from the toe), clipping about halfway between the end of the quick and the tip of claw. If you accidentally clip into the quick, don't panic. The claw may bleed for a moment, but it will usually stop very quickly. Soothe your cat by speaking softly to her and stroking her head. If the bleeding hasn't stopped after a minute or so, touch a styptic pencil to the claw end or pat on styptic powder to help staunch the bleeding. How often you need to clip your cat's claws depends somewhat on how much of the tip you remove, but usually a clipping every ten to fourteen days will suffice. If your cat absolutely refuses to allow you to clip tier claws, get help from your veterinarian or a professional groomer. Special claw trimmers (two types are shown) are available from veterinarians or pet supply stores, but sharp nail clippers for humans work just as well. Keep a styptic (astringent) pencil or powder on hand in case you accidentally clip into the quick and bleeding hasn't stopped within a couple of minutes.